Reading is a break for a graduate student. Change a child's life in just one hour every week-be an Everybody Wins! reading mentor at The St. Johnsbury School. Everybody Wins! 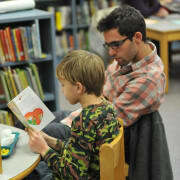 Vermont reading mentors are friends who read with the same child every week. Mentors are not teachers, tutors, or testers! Think of reading time like a bedtime story: a warm, comfortable time together to share a book. When children are read to one-on-one by a caring adult, research shows that their reading improves - and so does their interest in other subjects, their confidence, social skills, and interest in school. Everybody Wins! Vermont carefully matches mentors with children they will love to see and spend time with every week. We take into account your personality, interests, and preferences - and theirs! - when we match you with a child. Our mentors tell us that their reading day is their favorite day of the week. You can find out more about being a reading mentor at our website, www.everybodywinsvermont.org. You can apply online to be a mentor at http://bit.ly/EverybodyWinsapplication. Everybody Wins! Vermont is a statewide reading mentoring organization. We support over 550 mentors every year in 23 schools in Vermont and the Upper Valley of New Hampshire. One hour per week, over lunch, at school, from October 1 through the first week of May. We ask for a one-year commitment from all mentors.